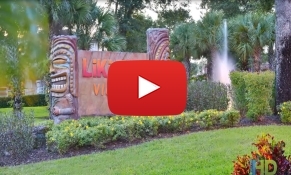 WELCOME TO LIKI TIKI VILLAGE - Orlando's Family Vacation Resort. Come enjoy the tropical splendor that is Liki Tiki Village Resort. Relax in comfortable accommodations that include a variety of amenities, including a water park, for the whole family. Liki Tiki Village is located only seven miles from Walt Disney World® Resort, SeaWorld Orlando®, and Universal Orlando® Resort. Explore the 64 acres of lush landscape around our Orlando water resort, stroll around the Polynesian-themed complex, and absorb its tropical beauty. Join your children in a pirate adventure at Liki Tiki Lagoon Water Adventure, an on-site water activity adventure, play mini golf, or stop for a bite to eat at Shipwreck Sally's Bar & Grill. Ride around the lake in a paddle boat*, play a game of tennis at one of our two courts, or rent a movie or a surrey bike. For a little competition, challenge the kids to a round of video games or one-on-one basketball, if you think you've got the moves. There's plenty to do without leaving our Kissimmee resort. (*Paddle boats are operated seasonally and are subject to water levels.) Our Orlando, Florida resort even offers an exciting waterpark for kids of all ages and families featuring water slides and a wave pool. Liki Tiki Village Resort in Kissimmee boasts 658 condominiums, and your family may choose from one, two, or three-bedroom furnished condos featuring a living room, dining area, fully-equipped kitchen, and washer and dryer. The condos have been designed with luxury, comfort, style, and convenience in mind. Comfortable beds, upholstered furnishings, and decorative accessories provide guests with a home away from home feeling. With over 600 units at Liki Tiki Village it is possible you may be booked in a 2-story townhome or in one of our high-rise buildings. All townhomes are two-bedroom, two-bath units. The high-rise has a combination of one, two, and three-bedroom units. All high-rise buildings have elevator access. When you're ready to go out on the town, you can tempt your palate at your choice of over 5,000 restaurants, tee off at one of 176 area golf courses, and satisfy your shopping need with over 100 unforgettable attractions and shopping at boutiques, outlets and malls. Stroll through the natural wonders of ""Old Florida"" at Forever Florida®, enjoy 50 acres of southern style gardens at Leu Gardens®, or meander through historic Bok Tower Gardens®. For pulse-pounding excitement, strap yourself in to drive or ride-along in a NASCAR® at the Richard Petty Driving Experience® or feel the sensation of skydiving at Sky Venture®! Information on Orlando area attractions and events can be found here. When you book your reservation at Liki Tiki Village Resort in Kissimmee, you can take advantage of specials, discount tickets, coupons, and special values for theme park tickets. It's easy to create family memories at over 90 attractions. From Liki Tiki Village, it is a short drive to all of the Central Florida theme parks, shopping, nightly entertainment, and thrilling dinner shows. It's no wonder Orlando is a popular year-round playground. Let us help you create vacation memories to last a lifetime.